Home Articles Cosmetotheque Ingredients Cosmetic innovation: repair and rejuvenation of the JDE by a polypeptide,"Cebeline". 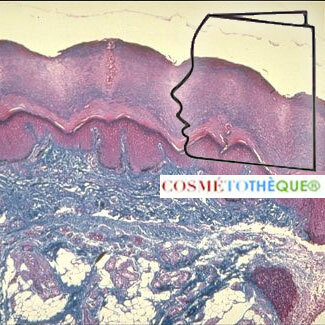 The dermis and epidermis are connected by an adhesion zone centered around the basal blade, called the Dermo-Epidermal Junction or JDE. It consists of thin sheets (50 to 80 nm) that separate the cells of different origin. On the epidermis side, this structure anchors the keratinocytes of the epidermis to the papillary dermis, and on the dermis side, the anchoring fibres interact with the basement membrane to form a network that traps the collagen fibres of the upper part. - a role in attachment, growth and migration. Maintaining the integrity of the JDE is particularly essential for tissue healing and repair functions. The JDE is a complex structure in which there are several specific structures or molecules: the hemiidsmosomes which connect to the keratinocytes, a basal membrane, consisting of two zones, the lamina densa and surmounted by the lamina lucida, and a dense sub-basal zone ensuring anchorage in the superficial dermis. 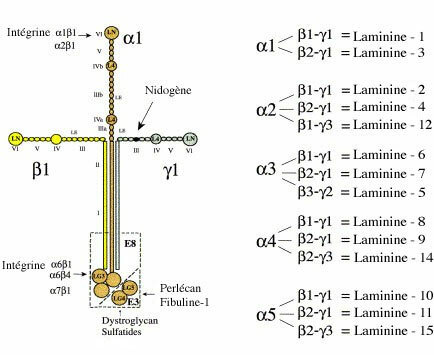 Among these, Lamininin 5 (LN-5) is the major and irreplaceable adhesion protein of the epidermis, but also of the majority of the body's epithelial cells. It is the essential component of the anchor filaments, structures that anchor the basal cells of the epithelia. It is synthesized exclusively by epithelial cells. The three subunits are assembled at their carboxy-terminal parts in the form of a super-wound alpha helix. The alpha3 chain, longer than the other two, has at its carboxy-terminal end a globular domain consisting of five repetitions of basic residues appearing as five globules called LG1 to LG5. Mature tissue LN-5 has been described as playing a crucial and irreplaceable role in dermo-epidermal cohesion. It assumes a structural role and participates in maintaining the cohesion of the basal blade. Moreover, it is a carrier of determining biological signals, since it allows the adhesion of keratinocytes through membrane receptors of the integrin family and induces the assembly of stable adhesion structures that are hemi-mosomes. In vivo studies of skin healing show increased expression of the different LN-5 chains by keratinocytes located in the wound colonization zone. More recent studies have identified LN-5"precursor" as the major matrix component in contact with migrant keratinocytes. The most characteristic recent fact is the evidence of direct interactions between Laminin 5 and collagen VII, an interaction that plays an important role in the integrity of JDE. One of the characteristics of skin ageing lies in the disappearance of epidermal microvillosities, altering the exchange functions between the dermis and epidermis, also significantly affecting the structure of the JDE. The dermo-epidermal junction is flatter because there are fewer papillae. The surface of exchange with the epidermis is reduced. The dermis is less integral with the epidermis. The skin loses its firmness, contours slacken, wrinkles form. Tissue healing and regeneration processes are also altered. Maintaining the integrity of this JDE is therefore an essential approach to ensuring skin homeostasis, an essential process in any anti-aging or regenerating skin care strategy. The different constituents of the JDE are affected by this process. LN-5, which is the most important protein, is also highly concerned. - fibroblasts from mature donors produce fewer laminins than those from young donors. To confirm this first observation, a second experiment using skin models, obtained in the same way from young or mature donors, was conducted. The results obtained show different production levels between the two models. Mature reconstructed skin produces half as much laminin as the other model. It is therefore obvious that this structure is affected by cellular changes resulting from the ageing process. The scientific theme of the team that worked on this subject is linked to the CNRS and focuses in particular on the study of a family of multifunctional molecules specific to basal blades: laminins (LNs). For several years, she has been interested in the mechanisms involved in maintaining the cohesion of the basal epithelial blades by choosing to use the human skin epidermis model. As a reminder, cutaneous tissue is a complex organ consisting of a surface of a protective epithelium, essentially cellular, the epidermis, and, in depth, a fibrous connective support, the dermis. Basal keratinocytes are connected to the dermis via a single complex area called the epidermal basal blade or dermal-epidermal junction. The molecular organization of the dermo-epidermal junction differs from that of other basal blades of the body by the presence of unique structures called anchor complexes. These multi-protein complexes ensure the adherence of the epidermis and enable it to resist effectively to various mechanical stresses from the outside. Given the structural complexity of the LN-5 and its multifunctional characteristics, it seemed wise to dissect the molecule in order to define its active domains. This allowed detailed studies to be carried out on the minimal signal patterns interacting with cellular receptors and with other components of the basal slide. Since the creation of the team, the work has been oriented towards tissue repair by focusing on skin healing. The scientific team tried to understand the role played by the LN-5 during skin healing and more specifically skin repair. Thus, the team developed a model to study human keratinocyte migration and attempted to elucidate the function of the neo-synthesized LN-5 during this process. The team is involved, in the form of scientific collaborations, in numerous research projects aimed at analyzing the precise expression and potential role of LN-5 and its receptors during certain carcinomas. The theme is of particular interest to the cosmetics industry, which is moving towards a cellular approach to skin ageing problems. Work on the study of keratinocyte/LN-5 interactions during skin ageing has been carried out. The objective of this collaboration was to try to restore a possible deficiency of adhesion related to aging. The expression of LN-5 on biopsies according to age was studied, as well as the adhesion capacity of keratinocytes on different substrates including LN-5. Based on the work of this team, a study was undertaken with the aim of synthesizing peptide fragments of particular interest with respect to adhesion properties. The working hypothesis consisted in choosing the sequence of these peptides in specific zones of the LN-5 molecule directly involved in the adhesion process. Several peptides were thus prepared by selecting sequences in different zones, in order to identify those that are most directly involved in the adhesion process and therefore most active. Cell adhesion studies according to a detailed protocol recognized and reproducible have been conducted in this laboratory which has expertise in conducting this type of test. - One of the peptides, that from the gamma 2 chain of LN-5, induces cell adhesion of the different cell lines tested, in a dose-dependent manner. The cells are firmly anchored on the peptide since they resist several washes under the conditions of the experiment. - Two different lots of the active peptide produced identical results. This peptide was retained and named Cebeline. Used as an active ingredient in various types of cosmetic products (repairing and anti-aging products), Cebeline peptide will replace its native counterpart (LN-5) when it is deficient or absent. The Cebeline peptide will thus restore the functions of the JDE, both mechanically by strengthening the structure of the JDE (better epidermal anchorage, better exchanges), and biologically by promoting cell adhesion and migration (epidermal regeneration). The efficacy of this Cebeline peptide contained in cosmetic products has been demonstrated through several tests. 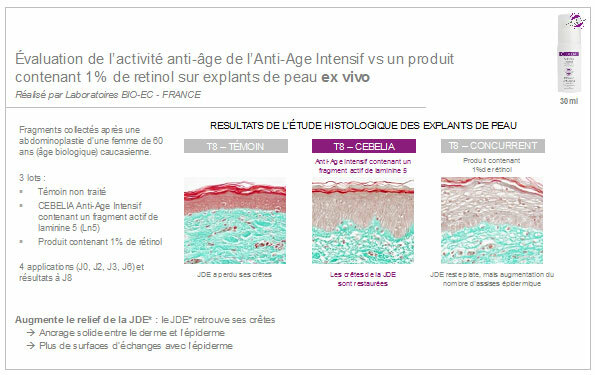 Ex-vivo study performed to study the evolution of JDE with the use of a product containing the peptide Cebeline in comparison with a competing product containing 1% retinol. The results show a significant effect on the JDE as the relief of the JDE is restored. They were the subject of a poster at the EADV (European Academy of Dermatology and Venereology) in 2016, showing a significant effect on tissue regeneration. The use of Cebeline peptide by dermatologists, surgeons and aesthetic doctors based on years of experience confirms its interest, tolerance and effectiveness, whether in repair or anti-aging action. 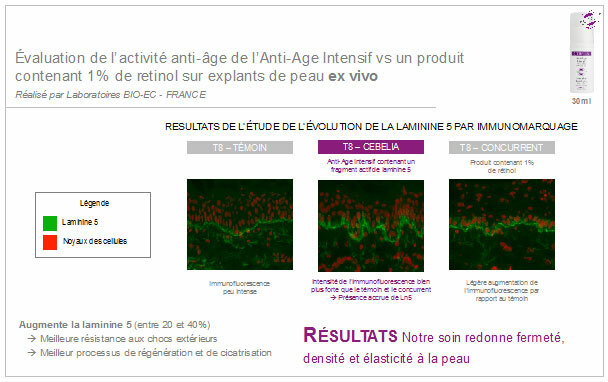 "Les Laboratoires d'Anjou", which are at the origin of this project, have designed the CEBELIA Dermo-Esthétiques Care in response to fragile skin, particularly in addition to medical and aesthetic surgery procedures. Each CEBELIA product is first and foremost the result of a need observed in the field, among aesthetic doctors and surgeons. Each aesthetic procedure has impacts on the skin of patients, and the objective is both to sublimate the gesture in the long term but also to repair adverse effects in the short or medium term. Based on the detection of a need, Laboratoires d'Anjou, in partnership with prestigious French research laboratories, seek the most effective targeted active ingredients and associate them with effective formulas adapted to fragile skin. Then, many round trips are made between laboratories and practitioners to optimize these formulas. It is fundamental for CEBELIA to ensure the perfect adequacy between its products and the expectations of the medical environment and patients. This medical guarantee is a real guarantee of quality and efficiency for all its products.